"Bukhara-and-sharif" - "noble and sacred" - is one of the numerous epithets, which was awarded to this ancient city. The great poets of the East of the IX-X centuries Rudaki Dakiki, Firdousi devoted kasids to it. In the X century "The History of Bukhara" was written. The first period of Bukhara was reflected in the national epic, numerous legends. The Great Silk Road connecting China with Iran, India and Europe, and passed through. Bukhara - one of few cities in the world which had been continuously developing on the same place since the V century BC. 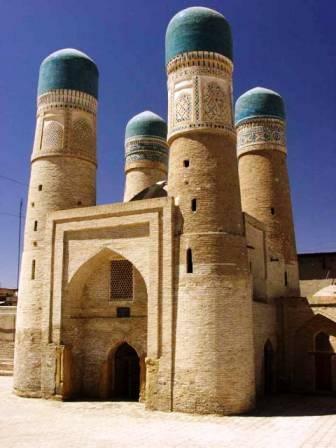 In 1993 UNESCO included the historical part of Bukhara into the lists of the cities of World Heritage of humanity. In 1997, under the auspices of UNESCO the 2500th anniversary of the founding of the city was celebrated around the world. The preserved architectural heritage of Bukhara is a rare combination of monuments of different epochs, which characterize the development of architecture for over twenty-five centuries. The most part of Bukhara's center is an architectural area, the main part of which is occupied by former madrassah. Now Emir Castle Arch (X-XIX centuries) has become a museum. Arch is located opposite the Mosque Bolo-House – Emir’s official place of prayers, built in 1718. One can come to a small area with a complex Poyikalon through the narrow side streets along the Arch. Poyikalon consists of Kalyan Mosque (XVI c.) - one of the majestic buildings of Central Asia, accommodating up to 10 thousand people: Mir-Arab madrassah - an acting Islamic seminary and Kalyan minaret - 47meters tower (10 meters in depth), which can be seen from almost any part of the old city. Madrassah is 850 years old. In the center of the old town there is an ensemble of Lyabi House with its elegant buildings around a small pool surrounded by mulberry trees. Street traders, old men playing chess and drinking tea, settled here. In the eastern part of town you can see the madrassah Nadir Divan Begi. It was built as a caravanserai, but Khan recognized the madrassah in it, and reformed it in 1630. Trade domes of the XV-XVI centuries: Toki-Sarrafon (dome of moneychangers), Toki-Telpak -Furushon (dome of head-dresses’ sellers), Toki-Zargaron (dome of jewelers) point on the fact that Bukhara in the past was at the crossroads of caravan routes. On the way to Samarkand, in the suburb of Bukhara, three kilometers from the center, Sitora-and-Mokhi-Khosa is located. It is the palace of Stars which look like the Moon (or the Moon and Stars) - the summer residence of the last emir. Now it is a museum. 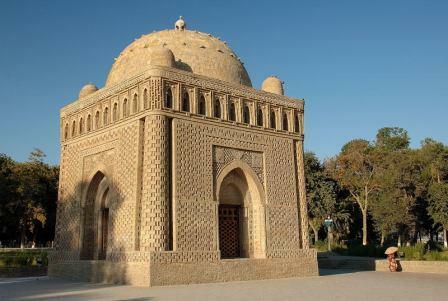 Bakhauddin Nakshbandi ensemble is located in 12 kilometers from Bukhara. The complex was the main sacred place of Bukhara. Bakhauddin Nakshbandi is one of the founders of Sufism in Islam.